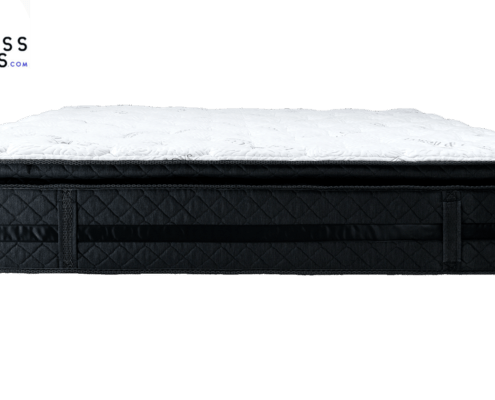 Logan and Cove Mattress Review l by Novosbed | The best Canadian Mattress? 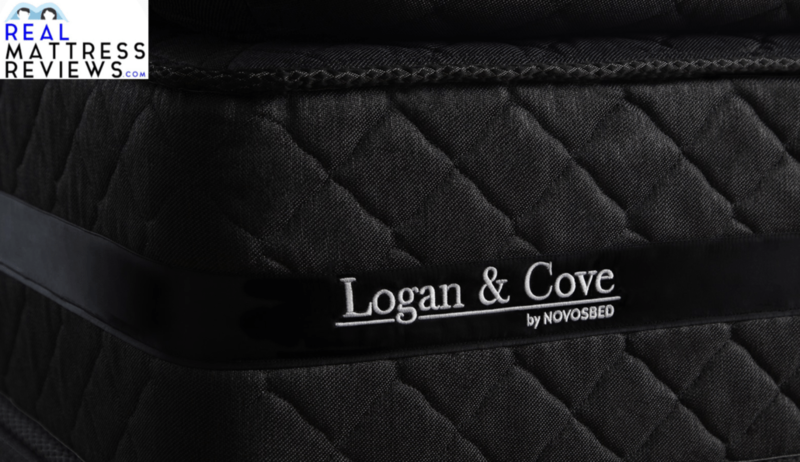 Introducing the all Logan & Cove from industry veterans Novosbed. The Logan & Cove currently is only available in Canada. It is a thick, high end luxury mattress but offers extremely competitive pricing. 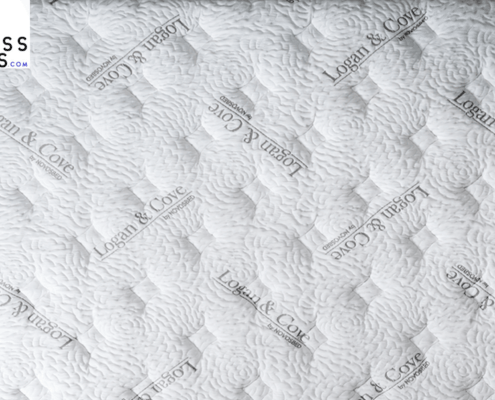 Logan & Cove advertise this product as the best priced luxury mattress in Canada, and, at first glance, this mattress does look as if there is something special about it. One of the most noticeable features about this bed is that it comes with a cushioned knife cut pillowtop…I like the look and feel of a knife cut pillowtop personally and they sell better than eurotops on my showfloow at my store. 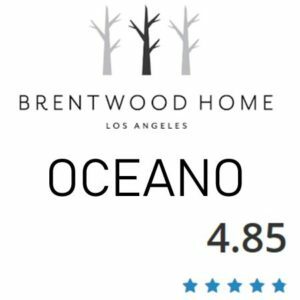 During this review we will look closely at what the feedback from real customers says, and find out if the Logan & Cove lives up to our exceedingly high expectations. 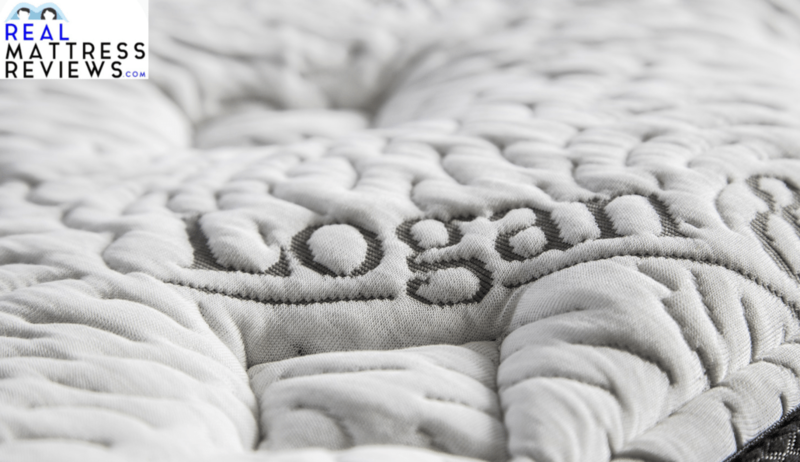 The Logan & Cove mattress is a product by (exclusively online) firm Novosbed, who have an A+ rating with the Better Business Bureau, so naturally we expect great things from this hybrid contribution. Let’s take a closer look at the Logan & Cove, and see how it stacks up against the competition… and against the sometimes acid tongues of your average consumer. 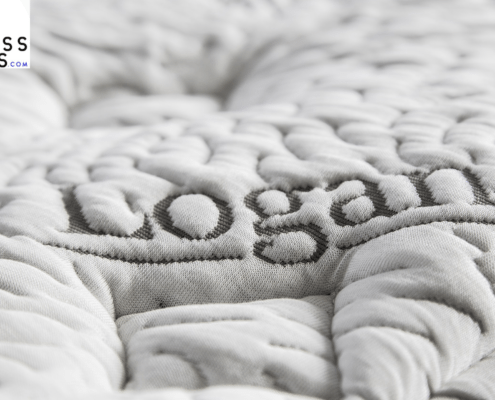 The delivery of the Logan & Cove mattress is FREE! It will be compressed and rolled up to fit into a cardboard box in a new method of mattress transportation that takes up less space and simultaneously combats CO2 levels. It will generally take 8-10 business days from the time that you order you mattress to the time that it arrives – but this could be sooner, depending on your location. 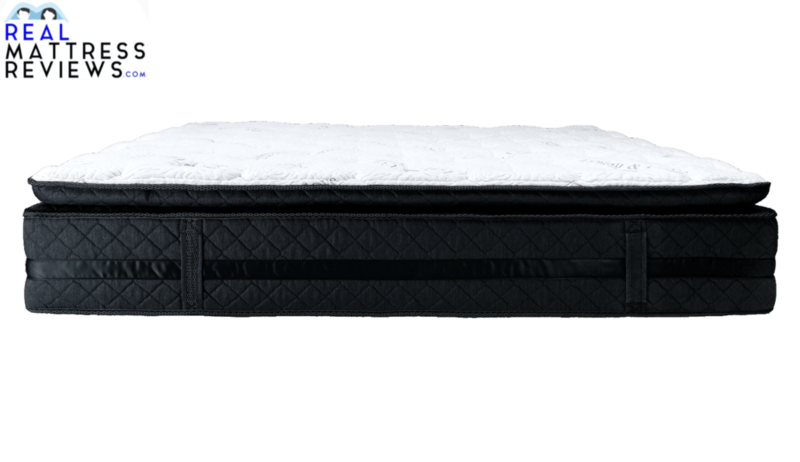 Are a back or stomach sleeper – this mattress provides great hip support and stops you sinking in to it with the use of some coil technology. It performs very well for those with consistent backache and is a good choice for those whose current mattress is hurting their posture. Need a bit of extra support – this is a fairly firm mattress that will provide a little bounce – but not so much as a spring mattress might. It also counters your weight with coils so that you don’t sink, giving you much needed pressure point relief while you sleep. Sleep hot – this mattress has the extra cushion top layer to provide further comfort, but underneath that it has a cooling layer designed to soothe and steal away the heat. So if you like a cold sleep – this one is for you! 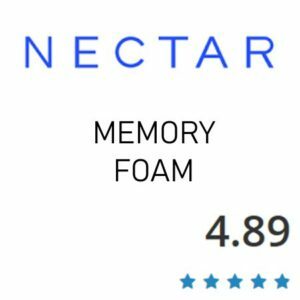 Those who like a soft bed – again, the firmness rating on this bed is a little high for those of you who want a super soft nights sleep. This is a bouncy mattress, not an enclosing one. Sleep very lightly – the natural spring back on this bed provides great support and minimal bounce – but it might still be enough to wake the lightest of sleepers out there. This Hybrid has the pocketed coils embedded that stop it from ultimately performing in the same way as a memory foam one does. When you sit on a memory foam mattress you sink in to it, and sometimes you can wind up feeling like you are sleeping inside the mattress, instead of on top of it! This mattress features a lot of bounce back and minimal sinkage, meaning that you wake up on top of it and you don’t need to fight your way out! Customers have reported that it is of reasonable firmness, with some liking their bed to be a little softer. 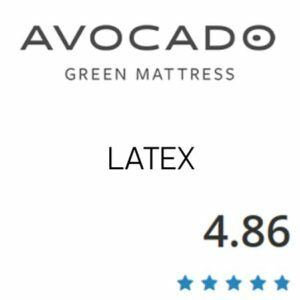 This mattress therefore sits somewhere around the middle of the firmness rating scale, around a 6/6.5. The Logan & Cove sports a pillow top layer, which is silky soft and welcoming even when there are no sheets on the bed (although we would never recommend you sleep sheetless, it is bad for mattress life). We also managed to track down a body map of pressure points, and found that this mattress is incredibly supportive to back and stomach sleepers – so if that sounds like you, you may be onto a winner. The Logan & Cove has performed better than well in motion transfer tests, meaning that the motion reduction on this bed is excellent – surprising, since it also scored highly for bounce. Consumers report little to no disturbance when sleeping next to a partner, and some were even surprised at how well they slept beside partners known to toss and turn. This mattress features individually wrapped ‘pocketed’ coils that are bound in memory foam which allows any weight dropped on the surface to be absorbed. Not only that, but the combination of high density foams coupled with that fairly unique and cushioned top layer means that any weight is spread, and any shock reduced to minimal bounce. In short; the hybrid technology used in this bed means it is bouncy, but the bounce is isolated to where you need it to be – under you, and not all over the bed. When you remove the plastic and box from your new Logan & Cove mattress, you may notice that it gives off a slight “new mattress” smell. “off-gassing” for me is a slightly misleading term, because no matter what brand you are looking at they are going to have a smell. Natural or organic mattresses tend to give off the most smell, contrary to the popular belief that they will smell the least. A smell is normal and, no matter which brand you buy, please remember that there will be a smell. I associate it with the smell of new shoes or a new car. In most cases the smell will either have dissipated or become incredibly faint 12-36 hours after unpacking your mattress. Once you cover it with a mattress protector and some fresh sheets there will be minimum to no smell whatsoever, and you will be free to enjoy your new Logan & Cove mattress! The way they have made this mattress means that the edges do not have the same pocketed coil support as the rest of the bed does. This is, as far as we can deduce, an excellent way to stop you from either falling off the bed or rolling into the middle. The middle of the mattress has bounce to push you upwards, while the edges all around are made from a dense poly foam that is designed specifically to aid those of us who sleep as a couple, and who live in fear of waking up on the floor. The Edge support is very dense and provides excellent support. 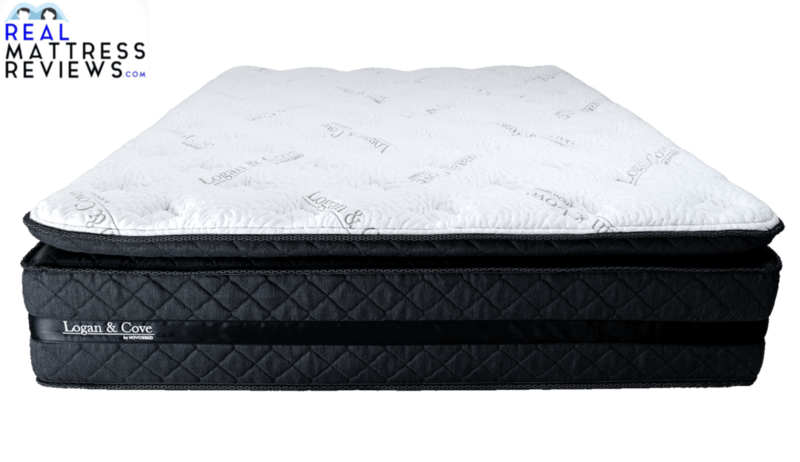 The Logan & Cove is a hybrid, meaning that it is made using both springs and memory foam to ensure the optimum in comfort levels. There are two separate parts to this mattress, the pillow top and the main body. Let’s look at the pillow top first. The pillow top’s cover is made from a material that feels silken, but is actually of the Novosbed brand’s own design. It is a highly environmentally friendly material that they call Natural Eucalyptus Fabric™. It is made from a mix of polyester, spandex and Tencel. Beneath that is a 1″ of Logan & Cove’s EcoLuxe™ Cooling Gel Visco Foam, a high density foam that will disperse movement and let you stay coll while you kip. Finally the pillow top cover sports a second one inch layer but this time made from poly foam. The foam is there to stop you from sinking in and give your bed a little bounce. The main body of the mattress starts with a two inch layer of high density bio-foam that provides a contouring surface that will flex to support your shape. The main section of this mattress consists of an 8 inch layer of pocketed coils that are individually wrapped in memory foam. Although this means there isn’t a great deal of airflow underneath you while you sleep; it does mean that you are left with a supportive, quality material that allows for bounce and stops sinkage. Poly foam is then wrapped under and around the springs, to provide a solid base upon which the rest of the structure can be built. The pillow top’s cover is made from a material that feels silken, but is actually of the Novosbed brand’s own design. It is a highly environmentally friendly material that they call Natural Eucalyptus Fabric™. It is made from a mix of polyester, spandex and Tencel. Logan and Cove will work great on any solid surface. The floor, platform slats, boxspring/foundation and they now offer an adjustable base as well. 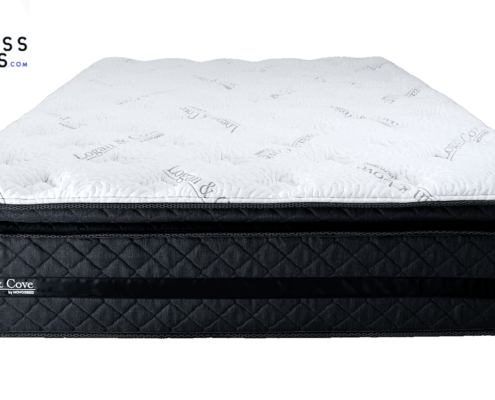 We had a good experience on the Logan and Cove Mattress. I am generally one who prefers thicker mattresses but Bear didn’t bottom out easily and had a good overall feel. I always use a mattress protector so some of the benefits of the cover may not have been noticed for me. The nice thing is now they offer a mattress protector that uses the same fabric as the mattress! The Logan and Cove Mattress impressed me for the following reasons. A.) To me the overall build and quality was above average. Its a huge mattress and its surprising it can also be rolled. B.) It worked well in all sleeping positions. C.) It has a perfect medium feel that will appeal to most of you out there. 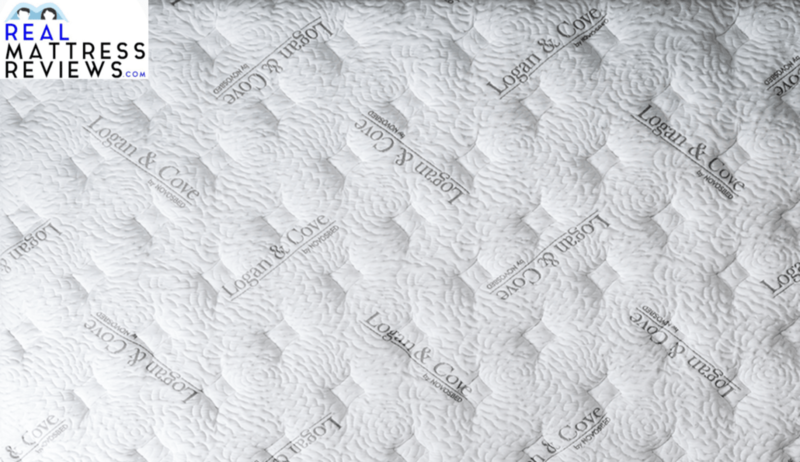 The Logan & Cove mattress sleeps pretty cool, since it has that soothing layer of coolant gel that forms part of the pillow top. The environmentally friendly and silky feeling mattress top layer is highly breathable, meaning that it allows air through while simultaneously soaking away sweat from your body. While at first glance the company have thought about us hot sleepers- they have missed a trick in the lower layers. The coils are pocketed and without much space between each other there is little opportunity for air flow through the mattress while you sleep. However, the theory is that the top layer provides the coolness, and consumers can’t decide whether it’s a hit or a miss in terms of a cool sleep. The Logan and Cove will work on an adjustable base to a point. If you plan on elevating to sit straight up I wouldn’t use this. If you want to elevate some for tv, acid reflux, snoring and things like that it will bend but to bend it a ton might not work that great. I would conside their Novosbed foam mattress for base users. 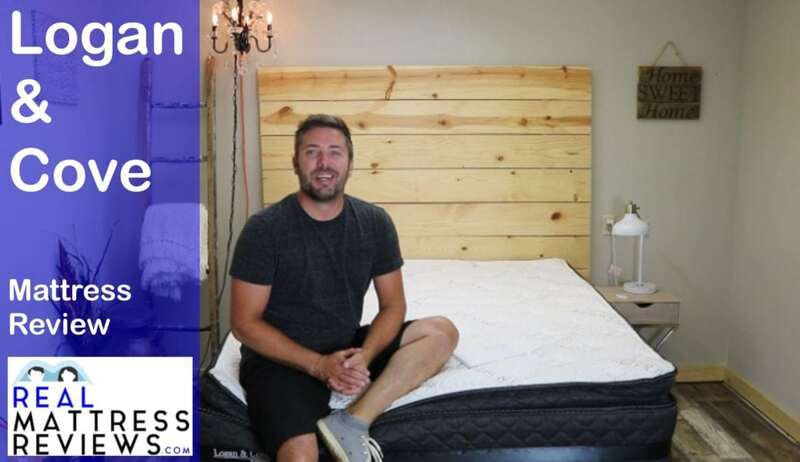 Mattress sellers tend to make some pretty wonderful offers to entice you into buying, and Logan & Cove is no exception. We have found, while researching various mattresses, that the longer the trial, the more confident the company are in their product. So when Logan & Cove offered a 120 night risk free trial and a no quibbles return policy we were pleasantly surprised. Not only to they accept your decision not to buy with no questions asked; but they will donate the unwanted mattress to charity instead of reselling… you really can’t ask for more than that when it comes to service. 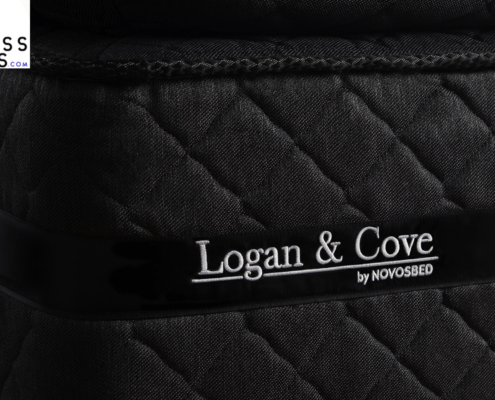 Logan & Cove is a sister company of the Novosbed. They are a Canadian company who ships the flagship bed to the USA. Currently the Logan & Cove will ship only in Canada. This mattress comes in six sizes and with a very attractive price tag. The twin version will set you back $999 Canadian dollars, and you get free delivery if you live inside of Canada…The drawbacks? If you don’t live in Canada you will have to pay a little to have it shipped to you. 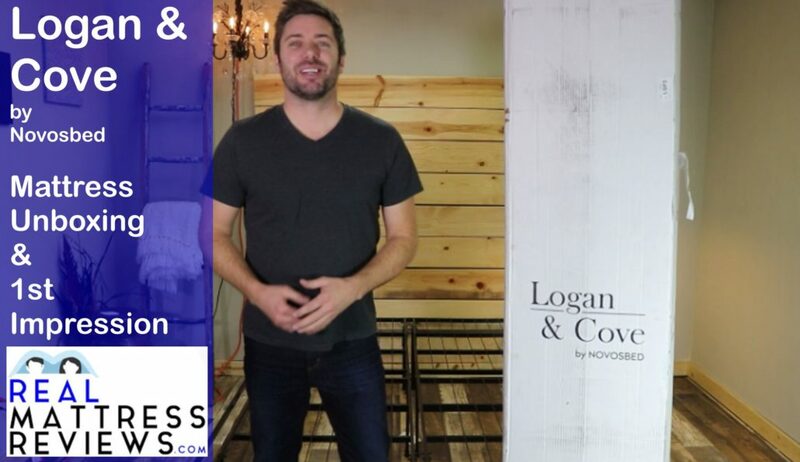 Logan & Cove are an offshoot of Novosbed who are proud of their online only set up because it lets them pass the savings from middle men and from the rent of a brick and mortar office onto the consumer and keep prices low. The ten year guarantee and 120 night free trial are great offers, that further speak to the quality of the product and how much faith the brand has in it. Also worthy of noting is that we didn’t find a single complaint about shoddy workmanship or poor quality… meaning that this mattress really does do as it promises – to bring luxury but affordable mattresses to the people of Canada!